It is with great sadness we share the news of the death of the Hospice’s Founder and President, Rev Canon Richard Norburn, who died on the afternoon of Wednesday, 15 November 2017. Without Richard there would be no St Nicholas Hospice Care. Many tens of thousands of dying people and their families have benefited from his vision and inspirational leadership over the last 33 years. Richard was a great man with an enormous heart, who worked tirelessly for the Hospice; he was our greatest champion and worked with a passion and enthusiasm that was infectious. Our thoughts and prayers are with Richard’s loved ones at this sad time. 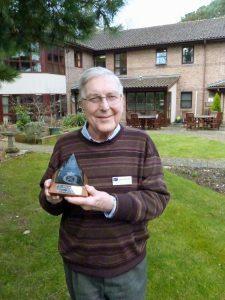 It was Richard’s vision that led to the founding of the Hospice, something he has referred to as being ‘the high spot’ of his ministry. Richard was involved with the Hospice since its inception; he chaired the first planning group and the first board. He became President, while remaining a Trustee, in 1987 after our first President, Bishop John Waine, left Suffolk to be Bishop of Chelmsford. Richard spent more than 50 years in the Anglican Ministry in Suffolk. He was ordained as Curate of St Gregory’s and St Peter’s, Sudbury, in 1959. From 1965 to 1974, he was Diocesan Youth Officer, living at Raydon, near Hadleigh, and covered most of the county. Richard then became Rector of Ingham with Ampton and Great & Little Livermere until he retired in 1997. Barnham was also added to his patch becoming part of the Blackbourne Team in 1992. He was also Rural Dean of Thingoe from 1978 to 1988 and was made an Honorary Canon of St. Edmundsbury Cathedral in 1981. He was awarded an MBE in the New Year Honours in 1997 and was married to his wife Joyce, with whom he shared four children and five grandchildren for more than 50 years. Richard served on many Diocesan boards and committees and was involved in the Healing and Deliverance Ministry. Locally he was involved with Churches Together in Bury St Edmunds and District for more than 35 years, serving as its Chairman for a number of years and on its management and unity groups. He also chaired Time to Listen, the ecumenical counselling group, and the Ecumenical Healing Ministry Group, and was a Trustee and Patron of BECT (Bury St Edmunds Ecumenical Centre Trust) and Trustee of Bury St Edmunds and District Christian Youth. 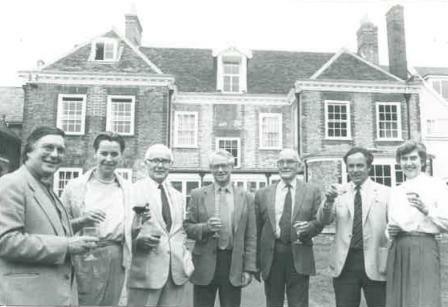 He was involved with the re-founding of Bury St Edmunds YMCA and was a Trustee for over 25 years, he was made a Vice-President and was awarded the Order of the Red Triangle for long service. For about 25 years, Richard was a school governor and involved with planning governor training both in the western area and across the county. If you would like to leave a message for the Hospice and Richard’s family please do so below. Please tick this box if you would be happy for us to print your name and message included in a book in memory of Richard. I am happy for my name and message to be published.